Randy Lee CUTLER walks in High Park & Chinatown: Note advance registration is required for the events at these sites. Tanja OSTOJIĆ offsite near OCAD U; find out the location at the Sunday Performance Art Daily, or check our website on the day of the performance. Many of our participating artists arrive with a treasure trove of publications, multiples, wearables or other items that come out of or are produced alongside their performance practice. These could be hot-off-the-press items or works that are difficult to circulate outside their own communities. We provide a public forum for the distribution and sale of those works by hosting the “official” Toronto launch of these rare commodities. Come join in a lively celebration and exchange of wares; there may even be a freebie or two! Check out work by Cindy BAKER, Annie Onyi CHEUNG, Elizabeth CHITTY, Randy Lee CUTLER, Silvio DE GRACIA, Bartolomé FERRANDO, Vanessa Dion FLETCHER, Francesco GAGLIARDI, MIKIKI and Graciela Ovejero POSTIGO. All proceeds go directly to the artists. Plus, attention researchers and history buffs! 11d.ca. For this ongoing project, we have started with our first festival in 1997 and are gradually working our way forward. Converting all of those old Video 8, VHS-C, and miniDV tapes, we are preserving and providing access to as complete a digital record of past performances as possible, subject to the approval of the artists whose work is featured. And finally, join us in celebrating the publication of More Caught in the Act the second anthology of performance art by Canadian women, co-edited by collective members Johanna HOUSEHOLDER and Tanya MARS. Inaugurated in 2002, this aspect of the festival highlights our commitment to bringing forward a lived history of performance art by presenting the work of key Canadian artists. We celebrate artists who have helped to establish, shape, and embody performance art in Canada. This year we are pleased to honour a solo artist, Elizabeth CHITTY, and a duo, Hélène DOYON and Jean-Pierre DEMERS (a.k.a. DOYON/DEMERS) who have performed from coast to prairie to coast—and whose influence is extended through their art practices and their teaching. Click on their artist links for a more in-depth consideration of their practices in their own words. Presented in conjunction with Toronto: Tributes + Tributaries, 1971–1989, an exhibition on view at the Art Gallery of Ontario from September 28, 2016 to June 15, 2017. This series features work by artists who created performance in Toronto during the period of the exhibition and since, reflecting upon the centrality of performance to Toronto’s artistic community from the 1970s through to today. The series launches on October 1 with a performance by Rebecca Belmore in Walker Court during Nuit Blanche. Over the following six weeks, performances by Walter Scott (at First Thursday on October 6) and Lillian Allen (on Friday Nights in October) will complement a series of in-gallery performances by Louise Liliefeldt, Keith Cole, Johanna Householder and Ame Henderson & Evan Webber. Visit AGO. net for the full schedule and details about each performance. Missed an event, or just want another perspective on what happened? Follow our festival blog at 7a-11d.ca/festivalblog. Updated daily, the blog contains critical writing by this year’s commissioned writers, Jessica KARUHANGA and Michelle LACOMBE, as well as photographs by our festival photographer, Henry CHAN. Also enjoy Margaret DRAGU’s daily livestream of VERB FRAU TV at 4 pm. Henry CHAN (photographer) has been documenting performance art in Toronto since 2006. He has photographed the activities of FADO Performance Art Centre for the last 10 years, six of the 7a*11d festivals, as well as events, exhibitions and performances at various arts venues. When he is not using a camera, Henry is crunching numbers and pushing paperwork as an accountant. Jessica KARUHANGA (blog writer) is an artist currently based in Toronto. She holds a BFA from Western University, and a MFA from University of Victoria. Her visual art and performances have been presented internationally at Goldsmiths, Deluge Contemporary Art, Whippersnapper Gallery, OCAD U, Videofag, Electric Eclectics, and The Drake Hotel. Karuhanga was featured in FADO Performance Art Centre’s 2014 Emerging Artist Series at Xpace Cultural Centre. She has lectured at The Power Plant, Art Gallery of Ontario, Royal Ontario Museum as well as Black Portraitures a biennial conference organized by Tisch School of the Arts at NYU. Michelle LACOMBE (blog writer, Montreal, QC) has developed a conceptual body-based art practice since her graduation from Concordia University in 2006. Her work has been shown in Canada, the USA, and Europe in the context of performance events, exhibitions and colloquiums. Her practice as an artist is paralleled by a strong commitment to supporting alternative models of dissemination and live art practices. She has worked with a number of Montreal artist-run centres such as articule and La Centrale Galerie Powerhouse, and is currently the director of VIVA! 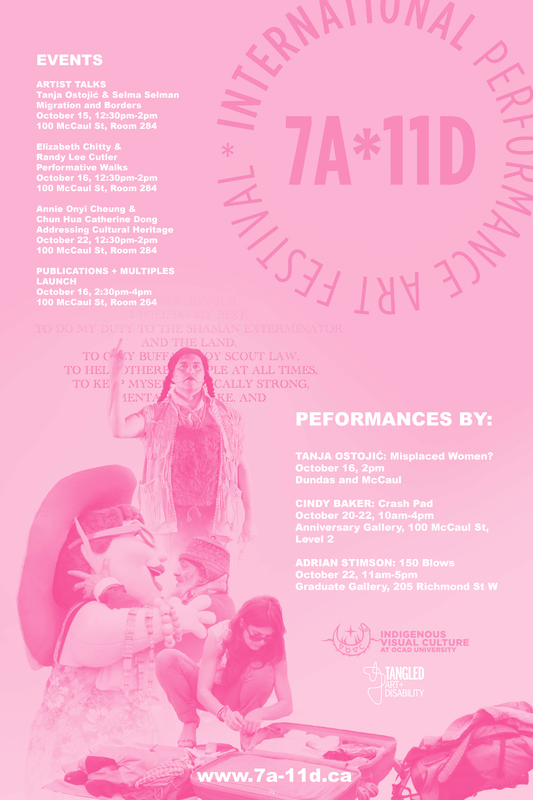 Art Action, a biennial performance art festival. In addition, she has had numerous and varied experience curating, writing, and resisting dominant culture.